These seven moonlighters are pursuing big professional careers -- and their entrepreneurial dreams. 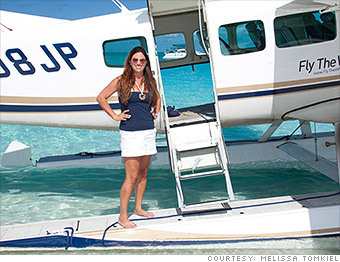 Tomkiel's firm, Fly the Whale, charters private planes for trips to the Hamptons, Nantucket and the Caribbean. Melissa Tomkiel handled a variety of small business and startup clients as an attorney with a law firm in Manhattan. That experience came in handy when she helped a friend start a private charter airline company, and eventually gave up her job to became its co-owner. "My father said I would always have my law license. But that I only live once and I should go for it," she said. With her aviation company up and running, Tomkiel is also making time to practice law again. Said Tomkiel: "I love doing both things. I probably would have made a lot more money working at a law firm full time but not as much fun as I have owning my business."